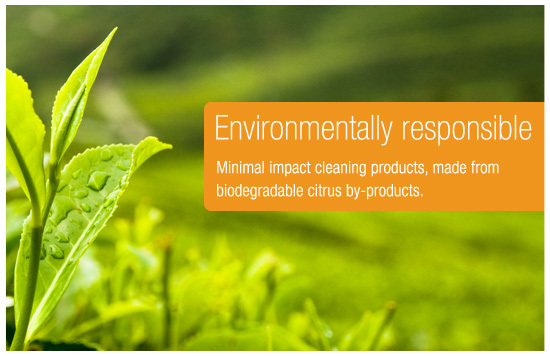 Citrus Resources has taken simple, renewable and harvested citrus crops and other plantation by products and turned them into natural, highly biodegradable cleaning products. There are over 40 different materials extracted from waste orange peel, pip and pulp as well as fresh juices. We use the magical deodorising effect of limes, the incredible solvent degreasing effect of D-Limonene (a solvent extracted from orange oil) to give a standard of product purity, biodegradability and performance that cannot be synthesised or matched by petroleum base. Combined with citrus crop by-products; we have used malt, castor oil and coconut or palm oil soap and detergents and sugar alcohols to provide cleaning benefits with little impact on the environment and high biodegradability. However, Citrus Resource products do not contain palm oil directly, but that the surfactants are derived from Palm Kernel. These Pal Kernels are from renewable sources as per the RSPO (Roundtable on Sustainable Palm Oil). Citrus Resource products contain no phosphates, sulphates, petroleum solvents or benzene detergent bases. The phosphates in detergents are helpful in suspending soil, softening water and boosting detergency. Their side effect is they are natural fertilisers which boost the growth of marine and weed to threaten marine and higher aquatic life. Sulphates are detergent fillers that serve no active purpose in detergents except to make them cheaper. Sulphates give problems in water way and sewerage lines because they are converted to sulphuric acid and hydrogen sulphide gas when in contact with acidic food and body wastes. This destroys the cement in pipe joints and puts further pressure on treatment works. No Silicate or caustics are used in Citrus Resource products, the only alkali source coming from ammonia, a substance that evaporates away after its job is done. With the phasing out of III Trichloroethane (Methyl Chloroform) and other ozone depleting solvents like methylene chloride, perchlorethane and Chlorofluorocarbon (C.F.C. ), Citrus Resource products offer a more ecological alternative to petroleum solvents or glycol ether solvents which are orange solvents or D-Limonene. Quats is not used in any of the Citrus Resource formulations as it can be highly toxic to marine life. Citrus Resources is a major supplier of purified ultra high grade D-Limonene in various aqueous and volatile formulations as an alternative. Not only are these products safer and less toxic to use, they are super biodegradable and clean better than aliphatic hydrocarbons. Biodegradable means simply "degraded by natural bacteria". The main thing that assists the biodegradation process is bacteria and to a lesser extent enzymes. These non-dangerous bacteria live in the earth, the sea, in sewerage treatment plants and in septic tanks. The toxicological, and above all, the ecological tolerance of all our products are the prime criteria in the solution of the raw materials and the processes used. For instance, the Citrus solvents biodegradability is faster than petroleum solvents. Phosphate substitutes such as NTA or EDTA's are not used because they do not biodegrade fast enough. Natural non-petroleum based ingredients are used because they are more easily broken down in the environment and ease the pressure on sewerage and septic systems. Many of the Citrus Resource products are approved by Good Environmental Choice Australia.Good Environmental Choice Australia certification details the level of compliance of the verified products against each criterion detailed in the Australian Environmental Labeling Standard, GECA 17-2007 - Cleaning Products. All surfactants in the GECA certified products are readily biodegradable substances according to the Australian Standard AS 4351.